Councillors from across Greater Manchester were among hundreds of mourners who have attended the funeral of the former Tameside Council leader. A service for Roy Oldham, who had become the longest serving council leader in the country, was held at Mottram Church, Hyde. 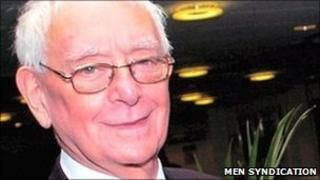 The Labour veteran died from cancer aged 76, just weeks after his 30-year leadership was brought to an end. His coffin was carried into church to the tune O Tannenbaum. Labour MP for Ashton-under-Lyne David Heyes, who attended the funeral said: "I think he's had the turnout for this funeral that he's deserved. "He was a colossus among local politicians and he really presided over politics in Tameside for a whole generation. "I think it's only right that so many people turned out to pay their respects to him today." Mr Oldham was replaced as Tameside's Labour leader in May, when the party voted in Droylsden East councillor Kieran Quinn. He had been re-elected as councillor for Longdendale at the May local elections.